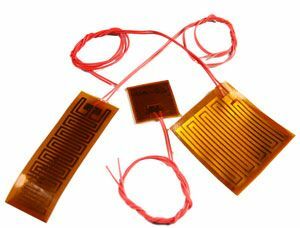 Kapton heaters in film or sheet provide a means to heat sample trays, cuvettes, reagent bottles, etc. inside a (HV) high vacuum chamber. Constructed with two sheets of Kapton® film that is resistant to chemicals, oils, and radiation and have a total thickness of only 0.008”. Maximum heat output is 150ºC. Lead wires are Teflon insulated with a length of 1 foot. Heating elements are 10 watts/sq. in. for rapid warm-up. Vacuum rated to 1x10-8 Torr and 200ºC maximum exposure temperature. Available with or without Acrylic adhesive. 1" x 1" Inch size. Kapton® heat film, 28 VAC, 10 Watts, rated for 1x10-8 torr. Available with or without acrylic adhesive backing. 2" x 2" Inch size. Kapton® heat film, 28 VAC, 40 Watts, rated for 1x10-8 torr. 1" x 3" Inch size. Kapton® heat film, 28 VAC, 30 Watts, rated for 1x10-8 torr. 2" x 2" Inch size. Kapton® heat film, 115 VAC, 40 Watts, rated for 1x10-8 torr. 1" x 3" Inch size. Kapton® heat film, 115 VAC, 30 Watts, rated for 1x10-8 torr.